In the process of installing the wires, one of the most critical stages of work is the removal of the insulation. No matter aluminum wire, copper, enameled or plastic insulated, in each case, you must follow the technology when it is stripped. 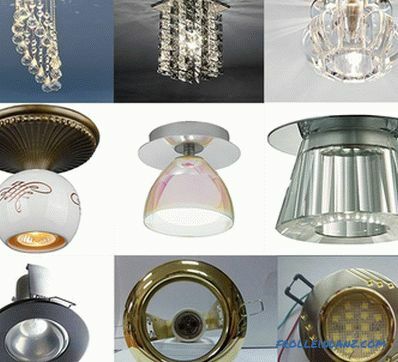 If you ignore the recommendations and tips on how to strip the wire, then the technical characteristics of the manufactured electrical system will be low. Consider several techniques for stripping insulation from a wide variety of coated wires. By single core is meant a wire in which a cross section is formed by a single conductor or conductor. As for stranded, the cross section of such a wire is formed by several thin wires, which in some cases intertwine with each other. In order to make the stranded wire elastic and resilient, a thread is added to the structure that resembles a nylon wire. Taking into account these features, the technology of isolation removal in each individual case may differ. When removing the insulation with a knife cut the wires in a circle with a blade in a perpendicular position - a notch of a copper conductor may form. As a result, with a slight bend the wire will easily and quickly break in this place, especially if you have taken to strip the wire with a thickness of 0.6-0.8 mm. After several bends the wire breaks completely. When stripping the wire with a knife, the blade should be almost in the same plane with the axis of the wire. Pre-insulation is cut along the core. The insulation cut along it is laid aside and simply cut off. With this option of stripping it is important to be careful, as you can easily injure your hands. Tools like side cutters , often used incorrectly. The tool is taken in hand as it is necessary, absolutely no attention is paid to the direction of the cutting edges. 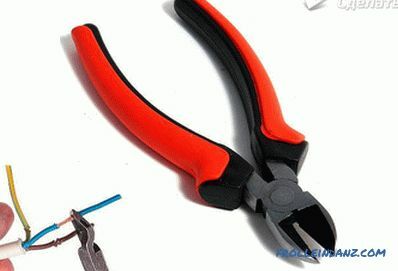 If used improperly, the side cutters will have to make great efforts. In addition, in this case there is a high risk of breaking the wire together with the insulation. It is important that the cutting edges point in the opposite direction to the tool movement. With this option, the blade will cut into the insulation, even with little effort. As a result, the insulation tube is removed from the surface of the core, without damaging it. If you have a soldering iron, you can quickly remove insulation by thermal method. To do this, heat the soldering iron tip and run lightly through the plastic insulation. After heating, the plastic will melt and peel off. This method does not violate the conductor. If you need to strip a large number of wires with such a winding, it is recommended to use a special device. For example, a special burner would be suitable for a tree that was previously known as "Pattern". The flashing method is most effective if your wiring is old. After a long life, the plastic winding on the wire becomes tough and brittle. Moreover, if the wire looks out from the junction box for two or three centimeters, neither the pliers nor the knife can cope with it. And if you use a cigarette lighter or a soldering iron, then clean the wire. If the conductor has a thickness of 0 2 mm, the best option would be a mechanical method of stripping. To do this, use a knife or sandpaper, which is scraped insulation. For processing a cable that has thin insulation, you can use fine sandpaper. Bend it in half with sandpaper inside. Then put the cable in a bent sheet of emery and, pressing the fingers lightly, pull the wire. This procedure should be continued until the enamel is peeled off. If a knife is used, it is necessary to lay part of the cable on a solid base. Then you must turn it in a circle until the enamel is scraped off the surface of the conductor. If the conductor is even thinner and has a diameter of less than 0.2 millimeter, then the mechanical method will not be effective. This is due to the fact that the enamel as a result does not disappear, and the wire itself can break. In this case, you can master the thermochemical method using a soldering iron and vinyl chloride insulation. To start, heat the soldering iron, then lay vinyl chloride on the table, and on top of the wire and along it lead the soldering iron. Under the influence of high temperature, chlorine is produced, which will clean the wire from enamel. 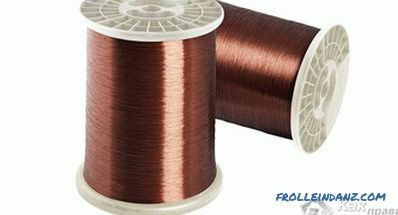 In most cases, such wires are used for radio communications, and it is this wire that is wound onto inductive coils. He also has a name - Litz. 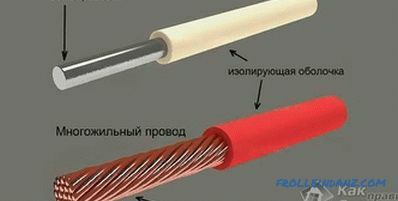 By its appearance, it is characterized by the presence of a large number of thin wires, which are twisted into one conductor and at the same time are enameled. Another interesting option is to remove the enameled insulation from the wire. You will need to buy aspirin tablets. The wire is laid on them and it is similarly passed through with a heated soldering iron tip. As a result, the wire is exposed and plus everything else is tinned. PTFE is meant a polymer that is produced by a chemical method. It has a number of positive characteristics, for example, does not get wet from water and is highly resistant to organic matter. Its technical characteristics allow it to withstand temperatures up to 300 ° C! As insulation is the ideal option, but the main drawback is the high price. In this regard, I use it in special cases. In everyday life, it is applicable to many radio amateurs, since after soldering it has an aesthetic appearance, takes up little space and does not melt. The material itself has the form of a thin narrow ribbon. She, in turn, tightly wound on the twisted stranded wire. Strip this insulation is possible only with a knife. PTFE is scraped to the desired length. As soon as the wire is exposed, the insulation is retracted to the desired length, and the remaining fluoroplastic is cut off. 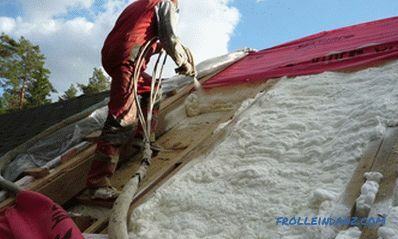 Insulation made of cloth, rubber, trimmed by any of the above methods. The main thing is to prevent the main core notch cuts! All of the above methods are manual. They require more time and attention, not to mention the experience when it comes to stranded wires with a small section. If you work in this area, and you regularly need to clean the wires from the insulation, it is best to partially automate this process. For this, ticks have been specially developed or else they are called - a stripper. With the help of a stripper, insulation is removed in one touch of the palm. 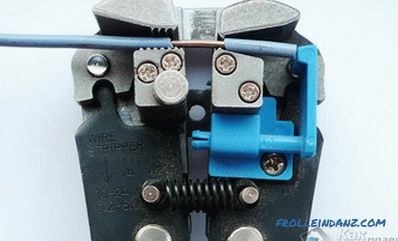 Consider how to strip the wires using a stripper model WS-04. You can remove the insulation and bite the wires Ø 0.5-2.7 mm with a cross section of 0.2 to 6.0 mm 2 without prior adjustment. When adjusting the microscopic screw, you can remove the insulation from a thin wire of 0.25 to 0.5 mm in size. 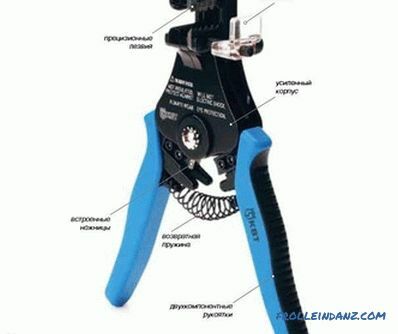 The stripper allows you to crimp connectors on the wires without insulation, insulated or automotive wires for a double clamp 0.8-2.7 mm. In its appearance, the stripper resembles tongs, at the end of which there is a lever cams. The upper cams are movable, and the lower ones are fixed. To clamp the wire is the left pair, and the right to remove and trim the insulation. At the first note of the handles, the left cam clamps the wire, and the right one cuts its sharp edge into the insulation. With the constant reduction of the levers, the insulation is gradually removed from the wire. The stripper wire stripping process takes a few seconds. The wire is inserted between the cutting knives, which are located on the inside of the handle. Then they should be reduced. The result is a cut end of the wire without deformation. For comparison, cut the nippers end always flattened and slightly sharpened. In the next step, one end of the wire is inserted between the movable and fixed sponge. After compressing the handles, the insulation is removed. With such work on the conductor there are no notches. To adjust the exact length of the insulation to be removed, you can use the blue movable stop. On a two-wire cable, insulation is removed by a stripper in two passes. From the first approach, the vinyl chloride tube is removed. At the second stage isolation from two wires is simultaneously removed. The operating time can take no more than 5 seconds! In addition, the stripper can also be used to strip off the telephone cable before pressing in the RJ-11 connector . If screw connection is used, insulation is removed from the wires with just one movement. The stripper can also be used to remove shielded wires. First of all, it should be noted that this is quite a difficult task, especially it is complicated if the conductor is thin. So, first of all isolation is removed from the shielding braid. To bare the central wire, the sheath is unwound with a needle or spike.It remains to make one movement with a stripper and the wire is released from isolation. Manual shielding of the shielded wire is laborious work, especially if you only have a knife at hand. It is very easy to damage the wire with a knife! So, as you can see, the stripper is quite a universal tool that cleans various wires from insulation. You can also strip the insulation on the coaxial cable do it yourself Although the equipment for this purpose is inexpensive and affordable, we will tell you about how to do the work with pliers and a knife. 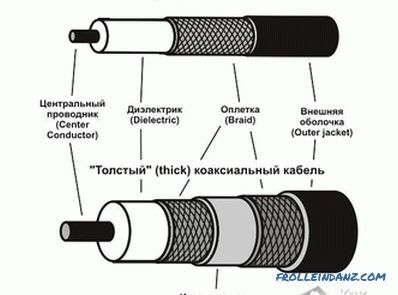 Typically, this cable is used to connect satellite TV and for standard connectors F.
The cable should be taken away from your body. Take a stationery knife and press the cable firmly at a right angle from the end of the cable at a distance of 2.5 cm. You can not press the end of the blade otherwise it will break off and may bounce into the eyes. At this stage, it is necessary to cut through the outer shell, the sheath, the foil layer and the dielectric foam. In most cases, it is white. Such layers are surrounded by a vein. In the process of immersing the blade in the cable, you will feel some resistance. As soon as the blade has come down to half the wire, it is necessary to push it less. It is extremely important not to damage the central core! Then you should go round the cable. At the same time, be careful not to leave notches on the core. Now pull and twist the cut edge of the insulation. By such actions, you can remove the cut end of the insulation. If wiring protrudes from under the cable sheath, cut them with nippers so that they do not extend beyond the edge of the sheath. It is important to examine the wire for serifs. If there are any, then the above procedure will have to be repeated. Dielectric foam can partially remain on the main core. You can remove it just with your fingernail. To connect the cable to the F connector, first remove a small part of the upper shell. To do this, measure eight millimeters from the previous cut position. Make a cut on the upper shell. As in the previous case, the incision is made perpendicular to the wire. Be careful not to hook the braid. 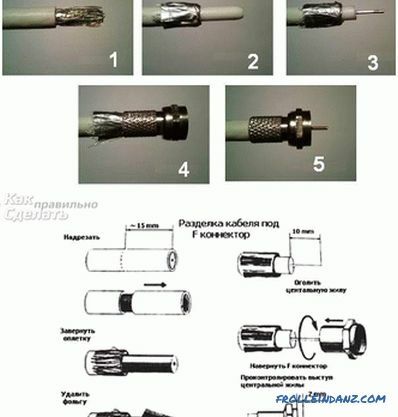 In some modifications of the connector F there is no need to remove the sheath, while others, on the contrary, should remove it. If you are not sure whether braid is needed in your case, then leave it temporarily. This braid is located around the dielectric foam. Its wiring is less than human hair, so all work should be done carefully. Just the same now the cut needs to be done with the tip of the blade all over the wire. Remove eight millimeters of cable jacket, so that dielectric foam wrapped in the winding remains on the core. Braid wrapped over the outer shell. So, the dielectric is exposed. 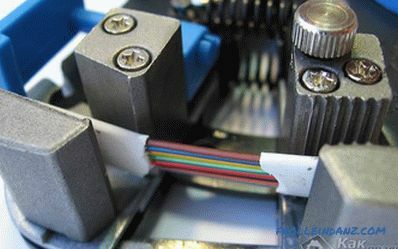 At this stage, pay attention to the requirement of the F-connector: exactly which end of the wire should be in your case. There should be no possible wiring between the braid and the central core. On the background of a white dielectric, it will be clearly visible. The F-connector is placed at the end of the cable. The dielectric should be located at the bottom of the connector after it is mounted on it. 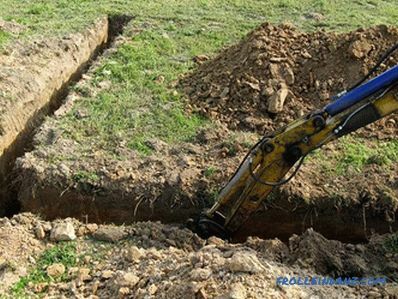 It is unacceptable that he looked out or did not reach the bottom of the connector. In no case is the contact of the tip allowed with F-connector. The F connector is now ready for operation. Separately worth saying about special knives that are directly used for stripping the cable. For example, the most popular is a crochet knife. In operation, it is much more convenient than the stationery. Moreover, thanks to the thick blade, they can work more confidently and braverly. It will be difficult for them to cut the insulation of the wire, but cut the cable along: this is what you need. Such a hook fits well into the cable sheath, so it does not jump out of it. 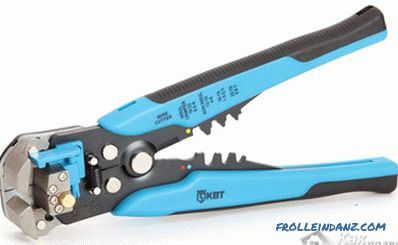 However, such a tool does not have all the advantages, as it cannot provide a good cable stripping. Another special knife is known. It is very simple in operation. For starters, use your thumb to squeeze a special brace. It is under it that you will thread the wire. At this point, a small knife that revolves around its axis peeps out of the handle. After laying the cable, the clamp presses it to this knife. Do two or three turns around the wire until the cut is made. Now, without taking out a wire, pull the tool with effort towards the end. 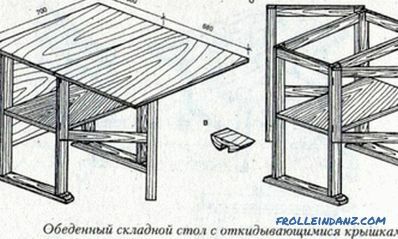 The knife will turn and cut along the shell.In the end, it remains to simply remove the cut off part and continue working. The only drawback of this device is that it is necessary to tune the wheel directly to the depth of a particular type of wire. To configure, you can use a piece of wire. Also, this knife is not very successfully coping with the elimination of insulation. This is due to the fact that the device can flatten a thick cable during careless actions. So, we looked at the most common methods of how to remove insulation from a wire. Perhaps one of the above methods will be useful in your case. Successful work! 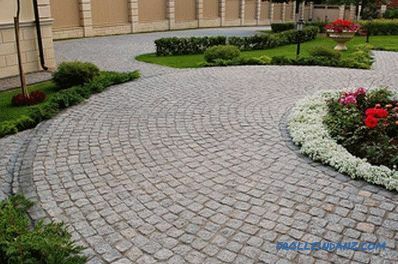 The tubag system is the best solution for natural stone, clinker and paving stones.